In the 1830’s, many settlers were drawn to the prairie land beyond Chicago because of the land grants offered by President Martin Van Buren. Those settlers were: Joseph Vial who built a log cabin on land that is now on Plainfield Road west of Wolf Road; Thomas Covell who settled on land that is currently Parkholm Cemetery on North La Grange Road; and, Robert Leitch who built his cabin on the southeast corner of Ogden Avenue and Peck. 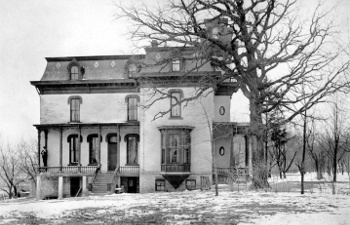 Leitch’s place was also known as “the garden spot of Cook County.” In 1870, Leitch sold a portion of his land to Franklin D. Cossitt who laid out the town which became La Grange in 1879.